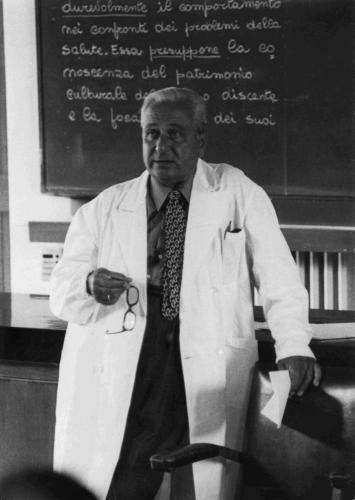 Alessandro Seppilli graduated in Medicine in Florence(1926), worked first as an assistant in Hygiene at Padua University (1928), and then as a professor of the same discipline in Modena(1935). In 1939 moved to St.Paulo in Brazil due to racial laws, where he directed a pharmaceutical company. After his return to Italy in 1949, he held the professorship of hygiene at Perugia University. He cooperated for the creation of the Hygiene Institute, of which he became president, and the Experimental Centre for Health Education. In 1960 he became president of the Faculty of Pharmacy of Perugia University. He held important positions: President of the I Section of the Superior Health Council (1974-1976) and President of the Italian Institute of Social Medicine (1971-1977). In 1978 he was one of the promoters of the National Health Reform. Heavily involved in social terms, he became hygiene Assessor of Perugia in 1952 and Mayor of the same town from 1953 to 1964. Moreover he was President of the Governing Body of Ospedale Policlinico Monteluce (1978-1980). He founded and managed "La salute umana" and "Educazione Sanitaria"
1. Retrieved from Casa dell'amicizia Seppilli's labels.